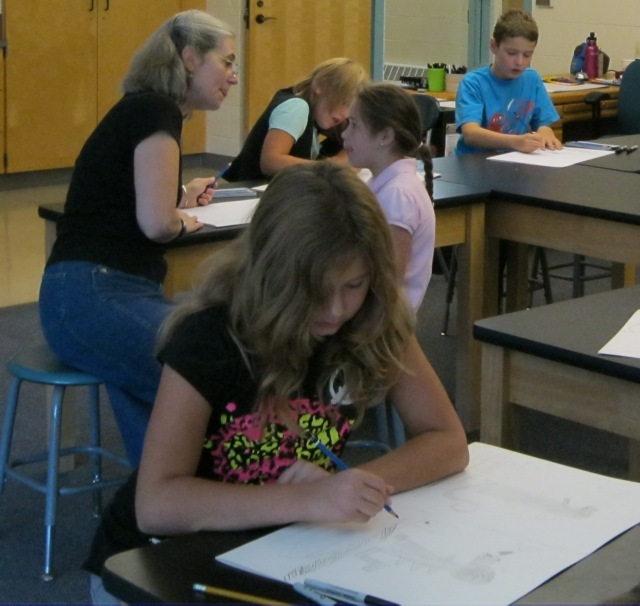 The art program at Farmington River Elementary School is one with many important goals and objectives. Brain research has shown that a quality art program helps students to perform better in all curriculum areas. This approach to whole brain development encourages higher order thinking skills and improved problem solving capabilities. 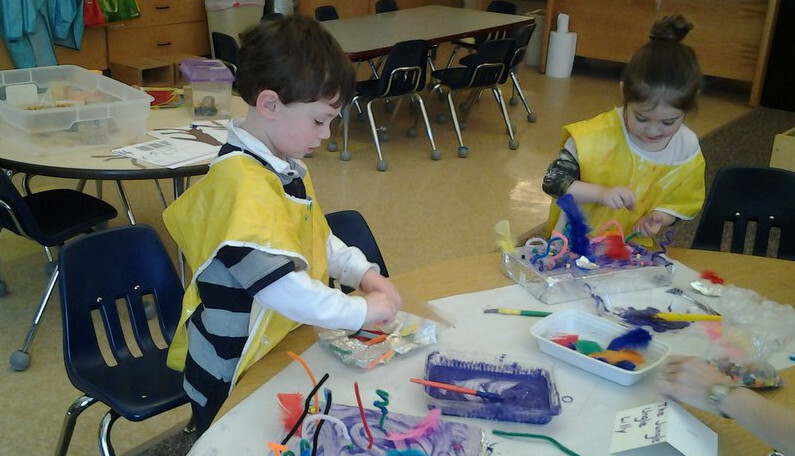 The activities and experiences that are offered in the art room can directly enhance the child’s performance in all areas while offering a unique opportunity for personal enrichment and self-expression. To present developmentally appropriate lessons that teach, through a variety of methods, materials and techniques, the elements of art and the principles of design. To present students with art problems that connect to their lives in a meaningful way. To encourage creative experimentation and risk taking in a safe and supportive environment. To expose children to art and artists from many time periods and cultures as a way to increase understanding and artistic literacy. To offer art based interdisciplinary instruction in order to help students develop new understanding as a result of making connections. To help each child realize his/her full potential, discover his/her creative voice and begin to employ it as a vehicle for self-expression. It is through the pursuit of these goals that the art program helps each student to gain a greater awareness of them self, the world they live in, and ultimately, an understanding of the art making process as a way to impact that world in a unique and meaningful way. paper towel rolls, egg cartons, all plastic containers with lids, plastic utensils, magazines with interesting pictures, large cardboard rolls, various sizes of cardboard boxes- especially those with interesting labels, large pieces of stiff flat cardboard, fabric, yarn, and any found objects that might be usable in a sculpture or mixed media project. If families have any other materials they would like to donate, please contact Ms. Catullo. Thank you! 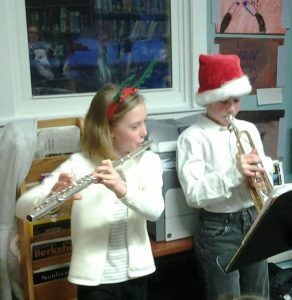 Music at Farmington River Elementary School is an important part of our students’ education. It is critical in providing students with knowledge of our world as well as broadening their knowledge of topics learned in their regular classroom. Skills developed in music class are transferred to other areas of their life as students expand their imagination, creativity, concentration, thinking-skills, and confidence. Mr. Goulet follows a curriculum requiring students to answer essential questions upon which units are built. As students move from Kindergarten to 6th grade, they will be presented with questions such as: “When does sound become music?” “How is the recorder a musical instrument?” and “Where do composers get their ideas?” Throughout the year, students explore stories in music, dances, instruments, world music, folk tunes, our country’s music, compositional work, music history, and more. In class, students work both together and independently to move, sing, play instruments, listen, perform, and critically evaluate music. It has been said that, “no one can claim to be truly educated who lacks basic knowledge and skills in the arts.” (National Association for Music Education) The music curriculum provides students with the stepping-stones to becoming cultured, educated adults. The creation of a variety of challenging, stimulating activities during each lesson throughout the academic year that instills in each child an enjoyment of movement. The acquisition of the basic skills of sports and fitness with which to be successful in play. The awareness of the basic concepts of fitness and health. Special attention is also given to experiences that develop social interaction, cooperation, and sportsmanship. The development of a sense of fair play and cooperation in children and the ability to work in groups and teams, leading to increased cultural understanding, is paramount in the Physical Education Program at Farmington River Elementary School. The primary objective is to foster in children a love of physical activity and play that stimulates the children’s desire to participate in physical activities not only during their school years, but also for the rest of their lives. Students will strive towards individual excellence through exploration and challenge. Students are expected to RESPECT INDIVIDUAL DIFFERENCES and RESPECT THE ABILITIES OF OTHERS. Students will exhibit good sportsmanship- encouraging one another, being kind and courteous to teammates and opponents. Students will recognize that physical activity can provide an opportunity to successfully interact in individual and group activities. 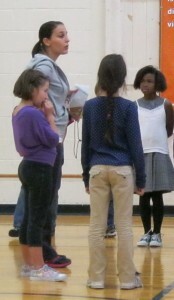 Students will experience the joy of movement and develop a LOVE for PHYSICAL ACTIVITY. To adequately prepare our students for citizenship in the Information Age, computer-related technology must become a tool that students and teachers use routinely. Integration of technology into each area of curriculum also maximizes learning. Linking technology with core instructional objectives is what makes good, effective use of technology. Through direct experience with a wide array of processes, knowledge, and context, technology education helps to develop technological literacy. 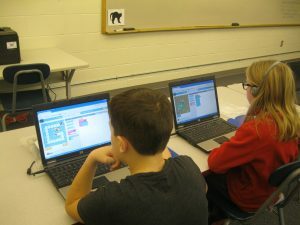 Every student at Farmington River Elementary has the opportunity to acquire a working knowledge and familiarity with computers. Our base begins with a PC computer lab for full class instruction. The hand-on activities focus on subject matter and show how appropriate technology can be employed as part of the overall learning experience. Computers are also found in the classroom where teachers demonstrate computer use and provide additional instruction. Each student in grades 4, 5, and 6 is provided with their own laptops for classroom use. We are proud to offer students a challenging and exciting look at technology and its ever-changing environment. Our staff is committed to an ongoing development of skills to provide with the best possible instruction. Farmington River Regional School District offers its students many opportunities to use technology during the course of their education. As part of this use, each student and their parent or guardian must sign an Acceptable Use Policy which says they agree to follow the rules of using technology.